WTF Are You Reading? 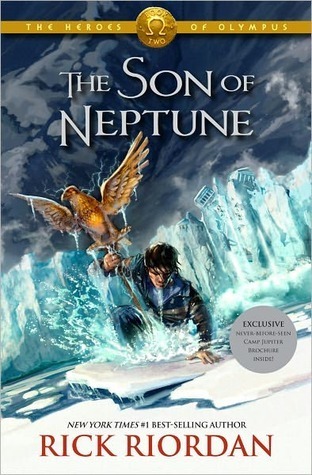 : The Book Gods Smiled on "The Son of Neptune"
Hazel is supposed to be dead. When she lived before, she didn't do a very good job of it. Sure, she was an obedient daughter, even when her mother was possessed by greed. But that was the problem - when the Voice took over her mother and commanded Hazel to use her "gift" for and evil purpose, Hazel couldn't say no. Now because of her mistake, the future of the world is at risk. Hazel wished she could ride away from it all on the stallion that appears in her dreams. This book is a wonderful blend of cultures and characters, brought to life in a way that only Rick Riordan can. The blending of the Greek and Roman traditions take a little getting used to after being used to the strictly Greek pantheon in which readers meet and fall in love with Percy. The Lost Hero, the first book of the series, comes off a little dry and may even inspire flashbacks to high school English classes via Jason a la The Odyssey. Anyway, The Son of Neptune seems to be where this series starts to come into its own. There is a clear and distinct Roman value system expressed in the gods of this book and characters start to act with the full knowledge of who they are and don't have to find there way out of amnesiac states first. With the exception of Percy. The subplots containing each character's back story and flaw are so masterfully woven into the over all direction of the tale, that they serve only to develop a precise picture of each person in the mind of the reader. Thereby helping that reader to form a strong and lasting attachment to said character for the duration of the read. The fact that Percy's love for Annabeth is the thing that gives him the strength to endure all of the trial that he faces is a wonderful romantic theme in a book that could have so easily forgone that aspect altogether. The quest mirrored the one with the Cronos in the PJ series, except that Gia herself doesn't come out to fight the heroes. Choosing to use her sons. The Death twist is just to cool not to mention as well. Joshua Swanson brings this series to life with the seemingly ever expanding range of pitch, dialect, and inflection that he is able to impart to each character that he voices. His female voices never lose their expressiveness and never seem forced. Mr. Swanson's voice expresses the excellence of this series in much the same way that Jim Dale did for Harry Potter. love this book! highly awaiting book 3, the mark of athena! great review!